← Finding Longitude In A Survival Situation. Astro-navigation (or celestial navigation as it is also known) is a fascinating subject that encompasses many areas of knowledge including geography, astronomy, history and mathematics. As you unravel the principles and techniques upon which navigation is based, you will be left in awe of the sheer genius of the ancient scholars and mariners who developed the art over the centuries to a highly sophisticated form. Yet, sadly, the art of astro-navigation lies dormant. The ever-increasing demands for speed and simplification and the ever-decreasing time available for training in navigation, coupled with phenomenal advances in technology have resulted in navigators relying almost completely on automated navigation systems. Russia is one of the few countries in the world to acknowledge the educational value of astro-navigation and to include it as an important part of the school curriculum. Why not just rely on the Global Positioning System (GPS)? Quite apart from the local risks of defective equipment, battery failure, generator failure and short-circuits to electronic navigation equipment caused by flooding, there is a very real global danger that the GPS could be destroyed. Couple the danger of solar storms with that posed by cyber terrorists who could block GPS signals at any time, then it can easily be seen that navigators who rely solely on electronic navigation systems could be faced with serious problems. Click here to learn more about GPS failure. So, how could seafarers navigate the oceans if the global positioning system (GPS) failed? The answer is, they could revert to the tried and tested art of astro navigation. What Is Astro Navigation? Whereas, in coastal navigation, we can obtain ‘position lines’ by measuring the angular distances between lighthouses and other geographical features, in astro navigation we obtain position lines by measuring the angular distances between ‘celestial bodies’. 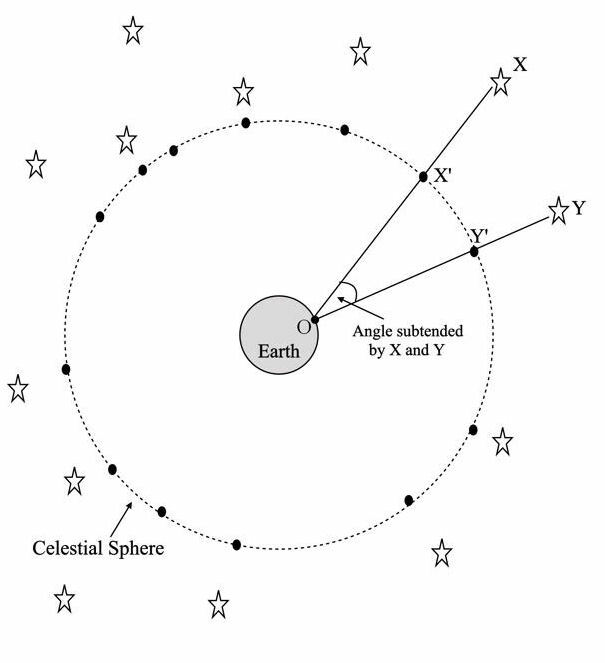 In the diagram below, X and Y represent two celestial bodies and X’ and Y’ represent their corresponding positions on the imaginary celestial sphere. It can be seen that the angular distance between X and Y is exactly the same as that between X’ and Y’. So, even though the celestial bodies are really at X and Y, no error is introduced by assuming that they are at X’ and Y’. As discussed above, we can obtain position lines by measuring the angular distances between X’ and Y’. 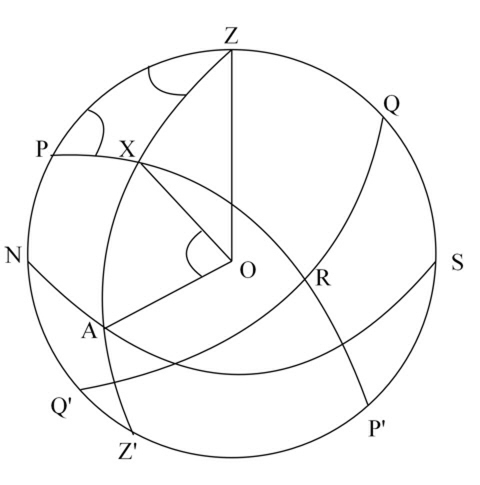 However, because the observer, at point O, is on the surface of a sphere and X’ and Y’ are on the surface of an imaginary sphere, we cannot solve the angle X’OY’ by the use of ‘straight line trigonometry’; instead we must resort to the use of ‘spherical trigonometry’. What Is Spherical Trigonometry? Sounds difficult I know but if you want to see a brief explanation of the topic please click here. This entry was posted in Astro Navigation Topics, Schools and tagged amazon, astro navigation, book, celestial, celestial navigation, celestial navigation for dummies, celestial navigation made easy, celestial navigation training, eBook, global positioning system, GPS failure, mathematics of astro navigation, mathematics of celestial navigation, navigation. Bookmark the permalink. 1 Response to Astro Navigation – What is it and why do we need it?